Prescot’s popular Elizabethan Fayre will return on Saturday 4 May and promises to be a great family day out with lots of new heritage attractions this year. 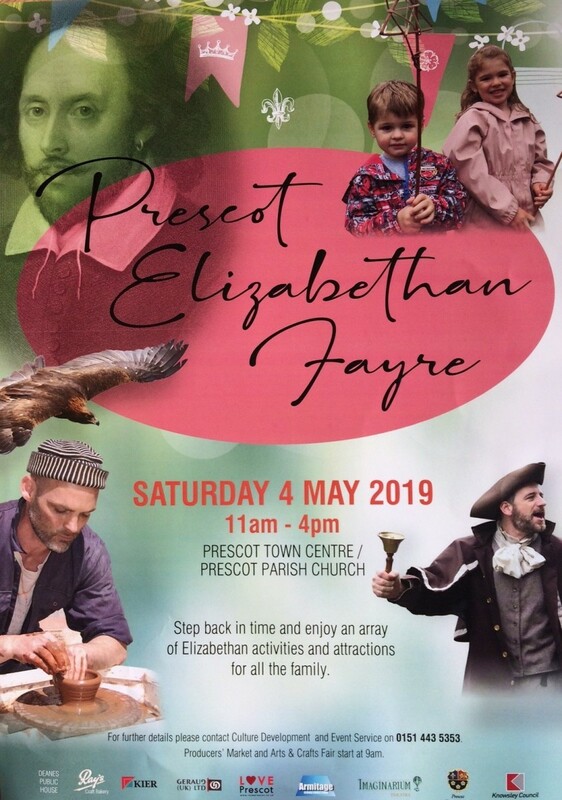 Prescot has a unique history and heritage as it was the only place in England (outside of London) to have an indoor playhouse in Elizabethan times, and this wonderful cultural heritage will be celebrated at the fayre. A traditional parade will launch the festivities, at 11am, as the town commemorates its special history with medieval music, dance, arts and crafts in a recreation of its famous Tudor fayres. Visitors will be able to try their hand at many free traditional crafts including willow making and friendship bracelets using traditional twist cord and braid weaving. Fayre-goers can also try their hand at wood turning and traditional pinch pot making. Children are welcome to take part in a free craft activity and make a ‘crown’ or ‘shield’ courtesy of Friends of Eaton Street Park. There will be demonstrations of traditional greenwood crafts including how to use a shave horse and draw knife and bodging on a pole lathe where visitors can have a go at helping to turn a spindle. Mucky Mountains Morris dancers will perform at different times during the day and spectators will have the chance to try out this traditional dance with some simple to follow steps from the troupe. Look out too for hilarious slapstick comedy performances from Imaginarium Youth Theatre’s masked players throughout the day. Birds of prey demonstrations and other family favourites like the circus skills workshops, exotic animals and native species for visitors to handle and face painting will be back again this year. New sponsors Armitage Construction, who are developing the Marketplace area in Prescot, will be hosting a traditional heritage trade skills stall featuring stonemasonry and joinery. Thanks to Prescot Town Council, Kier Construction, Ray’s bakers, Armitage Construction and The Deanes House pub for the different elements of the fayre they have sponsored. The Fayre will take place in and around Prescot Town Centre, Eccleston Street and Prescot Parish Church on Church Street from 11am to 4pm with free admission. The Producers’ Market and Arts, Crafts and Gift Fair will take place on the same day.